However, the former Chelsea and England captain knows that the midlands club's season would have to be deemed a failure if they fail to go up and restore their top-flight status. Terry snubbed interest from other Premier League clubs due to a reluctance to face Chelsea and the 36-year-old is still hungry to collect more winners' medals before he turns to management. 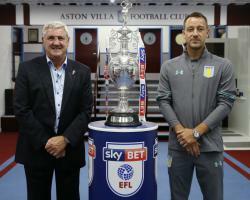 Asked where winning promotion with Villa would rank in his career, Terry said: "It would be really special, it would be up there for me. Working with other players, seeing another league that I've not played in, all of it excites me. "I don't think I'd ever want to come into a season where I'd go, 'I'm happy if we stay up or I'm happy if we finish halfway or do better than we did last year'. That's a big reason why I signed here; I wanted to be winning more times than I did losing. "We have to make sure we have an identity that we're going to be at it regardless, whether we play well or not." Twelve months ago Villa had hoped to go straight back up to a division they spent 28 years in prior to their relegation in 2016, but they experienced a disastrous start under Terry's old Chelsea boss Roberto Di Matteo and eventually finished in the bottom half. The acquisition of Terry, along with the likes of Glenn Whelan and Ahmed Elmohamady, has ensured the Villains are among the frontrunners for promotion this time around too. And Terry accepts anything less than a top-two finish will not do. Asked if not winning promotion would mean the club had failed, Terry said: "Yeah, you could say that. "The manager has pulled everyone together, his vision is clear, the players have the same ambitions and rightly so. I think we have to handle that. "We are one of the biggest clubs in the league and with the history of this club as well, it deserves to be back in the Premier League."